Seeds of Memories is the first official full-fledged Harvest Moon game developed with TABOT (LovePlus, Steel Chronicle) for mobile platforms, personal computer, and Nintendo Wii U video game console. 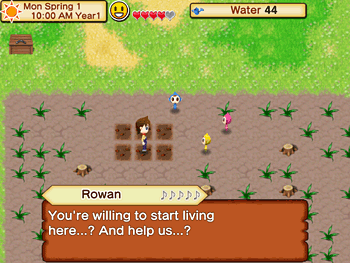 The game features standard elements such as crops, animals, foraging, mining, and town villagers. Players can choose between playing as a girl or a boy, find someone of the opposite gender to marry, and eventually raise children together. The game was first announced in June 2015, with a rough version shown at that year's E3 video game show. The game was first released on the Apple operating system, with the other platforms to be released after appropriate development and testing time. The game is similar to Harvest Moon: The Lost Valley for Nintendo 3DS, but with a different environment and features. The same villagers from Lost Valley make an appearance in Seeds of Memories, although some of them have different roles than what they had in their original appearance. Other features of the game include tool upgrades (which were missing from Lost Valley), crop mutations, a new bobcat pet, seasonal festivals, a night-time bar, and more. The iOS version requires 140 MB of space. The game does not require a persistent Internet connection and does not have in-game app purchases. The mobile platform will use touch-screen controls. The Android version requres 113 MB of space. The 1.5 version patch released in December 2016 added new animals, fixed some bugs in the iOS version of the game, and included new cooking recipes using the goods produced from the new animals. As a wandering traveler, you bump into a cheery lady along a mountain road. She tells you a little bit about the area you're exploring, but warns you that there isn't much to see down the eastern road, that she can remember anyhow. Once she leaves, you head east to explore the empty area, where you discover an old farm house and a neglected field. A small voice is heard in the distance, crying about being remembered. Once the initial shock of being seen wears off, the little voice introduces himself as Rowan the Harvest Sprite. He explains that the farm he is on used to be really big, but once the old owners left nobody ever stops by anymore. After a while, the humans who live in Chestnut Town completely forgot about the farm. The farm's soil lost its vitality and as a result, the Harvest Sprites lost their magical powers. With a little bit of effort, you help Rowan wake up his fellow sprites Blossom and Dewy. He's thankful that you've been able to awaken his friends, but there's still nobody around to run the farm. He fears that it will eventually fall apart again, and he'll just be back with the same problem he started with. You volunteer to live on the farm and help the Harvest Sprites revive the magical Sprite Tree. Without the powers of the tree, plants won't be able to grow in the area anymore. The Harvest Goddess instructs you to help the town villagers to remember the farm, by creating new memories with them. Now you are tasked with restoring the power of the Sprite Tree and revitalizing the farm.